Lately in our going off the grid series we have been focusing on water where we have covered everything from pumping & storing the water, to rain water harvesting & we even looked into greywater systems. This has brought us to one of the most important points we need to remember and that is that we are essentially the utility; and it falls on us to make sure that the water being delivered is safe to drink or use. I know, I can hear you know, now come on, that really only applies to surface streams – I grew up on well water & we never had an issue, or its rainwater which is formed from evaporation which makes it completely pure. Well lets first look into these water sources and then the best ways to make sure that the water you have is just as pure (or hopefully better) than what comes out of your tap now. So not only does water absorb the surrounding materials, but as we can see each area is different in the makeup. While one generally doesn’t have to worry about bacteria or viruses in well water those can still exist, especially if you have a dug or driven well. One other major issue with any of these types of wells is actually summed up in this line, “Problems with water sewage treatment in nearby Woodland Park led to contamination of Manitou’s natural springs in the 1970s.” This doesn’t include the issues with other contamination sources like pesticides and chemicals that can trickle down into the water supply or are getting injected into the ground. The process of evaporation is one of the most effective ways to make the purest water available. With that said, have you ever noticed that the leaves & grass appear a little shinier & greener after a rainstorm as compared to a regular watering? One reason for that is because the rainwater contains nitrogen that happens because of a process called atmospheric nitrogen fixation. Another reason is that the sky might appear just a little bluer as the rain has helped cleanse the air of smog and other impurities. Would you like to guess where those impurities now reside? This doesn’t even start to account for what might be on your roof or in the gutters. As a side point on this, not a single jurisdiction out there will approve rainwater for as “potable” without some method of treatment. Even if one was to use it for not-potable purposes, many require that it be labeled, a special purple colored pipe is used &/or it is treated with chlorine if used inside (even if used for just flushing toilets). For well water, it is definitely best to have your water tested to see what it contains & what it will take to filter out the items you need to. This should generally be done after the well is completed (and maybe required by the state already). We would also recommend testing maybe every three to five years after that. Yes, I know plenty of companies say every year, but they generally make their living off of testing. With that said, if you notice any changes in the water, or slime developing (popping the lid off the toilet bowl is a good place to check for that) is a good tip to bump up your test (see next section). The same also holds true if the well gets submerged by water via a flood, you have issues with your septic system, or some other sort of spill happens near the well. There really isn’t a good test for rainwater per se, but after the system is up & running I would consider testing it after a few months of operation and maybe every year to three years after that depending on your location, upkeep, & material choices. One item you should be mindful of is aerosol pesticides, chemicals & poisons as these can easily collect on surfaces & be introduced into the water. When one starts looking at all the available tests, it can not only be mind boggling but can get downright expensive if someone was to test for everything under the sun. Fortunately many companies offer testing packages that will scan for common bacteria, metals, pesticides, etc… that run anywhere from $79 to just under $300. Another major consideration is what might be around you & impacting the water. 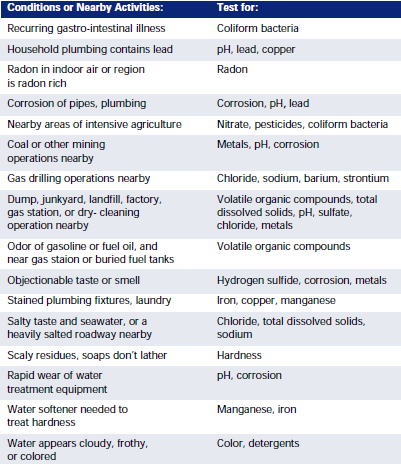 The EPA provides this chart – P13 (along with a ton of other useful info in this booklet & on their site) for specific tests you may want to add if they are not included in a package already. No, you probably don’t require a skid mount system like this one from our friends at Rain Harvest. 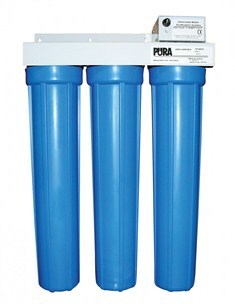 In case you are curious, this system was designed to handle a huge amount of toilets off of rainwater & contains all the pumps, filters, chlorine & coloring injection systems required. 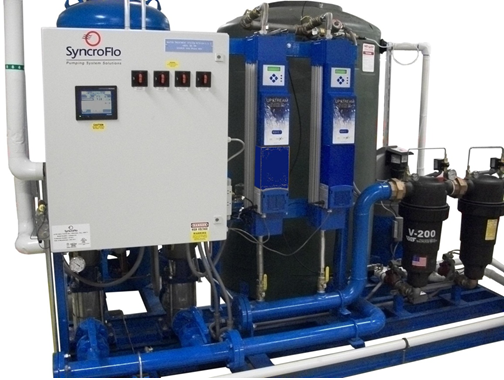 How about Reverse Osmosis /under the sink mount filters… Reverse Osmosis is a very wasteful process and generally requires 3 to 5 gallons of water for every one produced & many of the other “under the sink” systems either use the same process or the same filter setup I listed above. How often do I have to change the filters… You know the best answer for that is based on what the manufacturer recommends. But herein lies the rub, seeing most people don’t track their usage the manufacturers generally just use simple time frames like 3 months on pre-sediment filters, 6 months for charcoal, 1 year for the light, etc… instead of every X gallons based on this level. Any other tips or advice… Install backflow preventers on all hose bibs to help prevent any accidental contamination of your water supplies or storage. The last piece I will leave you with is to beware of the slick sales tactics used by many – if you are in doubt about something check with the state agency in charge of the Clean Water act &/or check out the information on-line on the EPA’s site.